Just a quick first look having now played the game once I think its one I would like to add to my collection. It is as far as I can see from this admittedly cursory contact a good fun game very much modelled after the pattern of the second version of Basic D&D where non human character races where character classes. The game uses a d20 based system of its own design combined with a dice chain which may have you rolling some pretty odd dice rather than adding large modifiers. It also includes a considerable degree of randomness especially with spell casters and the risks of becoming corrupted by the arcane if a magic user. Alignment which is present sticks to one axis law - neutral - chaos with law having strong undertones of good & chaos as evil but its up to you how far you go with this. 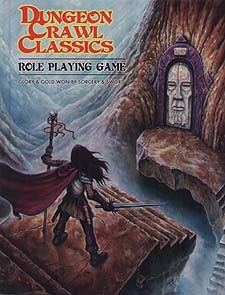 It seems to be an easy game to get into, especially with the funnel each player taking a group of four randomly generated zero level characters on an adventure which in the manner of some old AD&D adventures allows you to shape those who survive into a first level character, whose class if human & much of their character is formed by this first adventure. There are as I have noted else where online character generators which make the generation of characters for the funnel very swift & painless & even those of much higher level very straightforward indeed. Everything you need for old school gaming in one book. A cross between 1st Edition AD&D and some of the simple mechanics of d20. A comprehensive, fast rules system, which has a brutal starting point - Level 0 adventurers picking up their pitchforks, quills and left over old weapons from around the village to save the day. Key features: Simple combat system Powerful magic (although a little unpredictable) Fighters that are tough and actually useful Character classes that hark back to the old days - thief, Elf, Halfling etc.. The magic system is great - a lot of use of random tables for controlling unstable arcane magic - good and bad effects! What adds to the old school atmosphere is that magic can be unpredictable, an must be used at a direct cost (blood, flesh, curses etc..) on the casting magic user. But the spells are very effective compared to the almost formulaic ones in Pathfinder / 3.5 or 4th Edition powers. The system is fast in play, and adventures move on at a great lick - going through the first published adventure (Sailors on a Starless Sea) took just three sessions of rollicking fun, whilst we were learning the rules and getting used to the system. This is quite a refreshing change from some of the systems out there (Pathfinder, D&D 4/ 3.5, Runequest etc..) it is even more flexible than Savage Worlds. It has a distinctly old school Conan / Ffahd / Thongor / traditional swords and sorcery feel to the game, and re-introduces the fun factor that has been a little absent (IMHO) in some of the more technical recent rulesets. The XP system is very simple and low overhead, and makes the job of accounting for XP simple for both DM and players alike.